Have you met Erin the Elf yet? 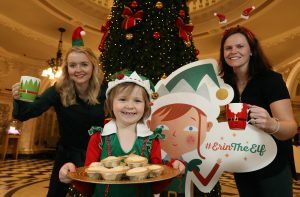 Would you like to join Erin the Elf and host a CCUC Christmas Coffee Morning in aid of the Children’s Cancer Unit? It’s easy! Just get in touch with us and we will send you your very own festive fundraising pack to get started. Click here to contact us or send an email to Jacqueline@childrenscancerunit.com with details of what you would like to do and when. Remember, all funds raised through our #ErinTheElf campaign will go directly towards supporting families affected by childhood cancer in Northern Ireland, as well as assisting the incredible work of the team at the Children’s Cancer Unit. We can’t wait to hear from you and to see any pictures from your CCUC Christmas Coffee Morning, so make sure you share all the details and photos with us using #ErinTheElf .